Matt comes to the Common Wealth team with 25 years of in-depth engineering and development experience. As a full stack developer, Matt has built everything from platform design and architecture to product implementation. 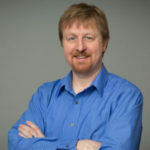 Matt utilizes his experience and skills to evaluate prospective companies to create high growth technology solutions. Applying to participate in the Star Tank Pitch Event is the ideal way for you to present your current business, entrepreneurial idea, new business plan, technology or service to our Star Tank Panel. Our local investors are prepared to become stakeholders in businesses they determine to have a significant potential for profit, positive economic impact and job creation throughout the region.